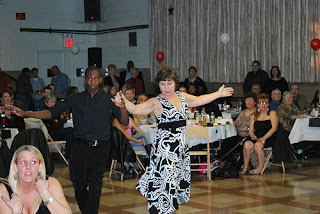 Vincent Renda, the chairman of the Sunnyside Woodside Boys & Girls Club, set the mood for the group’s “Dancing with the Stars” fundraiser on Saturday night when he talked about this neighborhood’s heroes. To meet that end, Renda and his 21-member board, held a fundraiser based on the popular TV show ‘Dancing with the Stars’ that has swept the nation. In this local adaptation, ten couples, each consisting of a professional dancer and a noted Woodside/Sunnyside resident, turned out at the St. Raphael auditorium before an audience of nearly 250 residents to dance in the name of the Boys & Girls Club charity. Local businesses helped underwrite the fundraiser, with Bar 43 providing free beer and Lowery Liquors donating all of the wine (72 bottles in total). Additionally, Dazies Restaurant subsidized the food, with Lily Gavin, the owner, bringing in workers to serve pasta, meatballs, Italian sausages, bread and salad. By the end of the evening, more than $6,000 was raised. However, that figure might rise, since the winners of the raffle (first prize: $10,000; second prize: $7,000) have indicated that they might donate some of it back to the club.